'Villages' Help Neighbors Age At Home In neighborhoods across the country, groups of people are banding together to help the elderly stay in their homes. These non-profit groups are called "villages," and they help provide seniors with security, practical help and companionship they need to stay happily in the home they love. In a series, NPR explores high- and low-tech ways to make it easier for seniors to age at home. 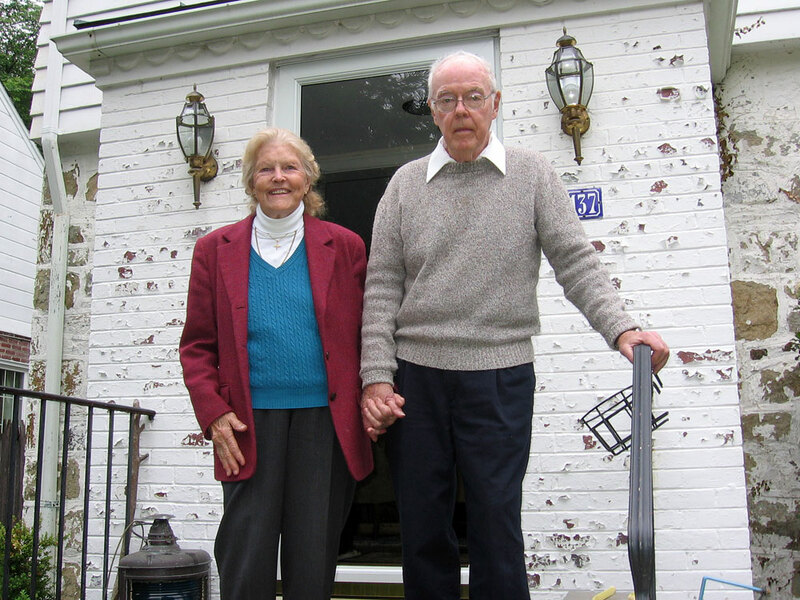 Betty and Jack O'Connor want to stay in their Chevy Chase, Md., home as they age and are trying to create a network of volunteers in their neighborhood, called a "village," to help them with tasks they can no longer handle. 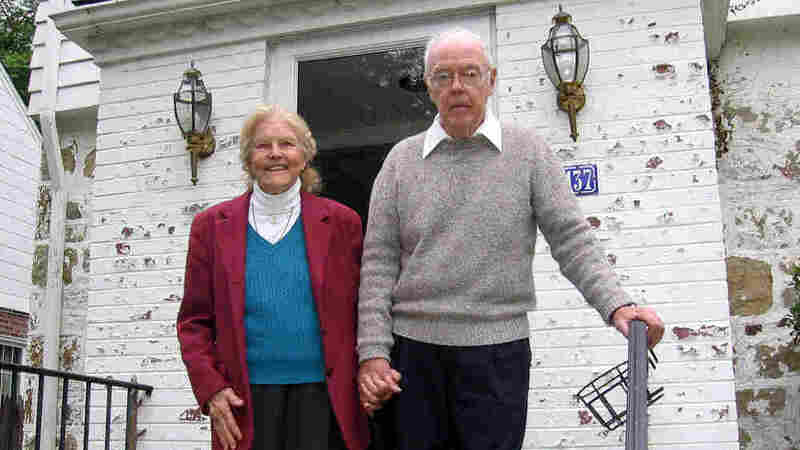 In Chevy Chase, Md., Betty and Jack O'Connor are part of a growing number of people banding together to help each other grow old at home. Betty is 80, Jack, 85, and it's something of a triumph that they're still living independently in their suburban house, with its backyard garden and pool. Jack suffered a brain injury in a fall five years ago. Since then, a hip replacement has left him frail, and an allergic reaction to the anesthesia in that operation stole even more of his memory. "This is my miracle man," Betty says. "And Jack and I do not want to leave the house." "Oh, no," Jack agrees. "I don't know what the alternatives are, but I can't think of a good one." The village movement dates to the 2001 founding of Beacon Hill Village in Boston. This year, the Village to Village Network launched to help other communities create their own senior support groups. Home Instead and Senior Helpers' services include companionship, conversation, meal planning and house cleaning as well as Alzheimer's and dementia care. Lotsa Helping Hands allows visitors to create a volunteer community designed to help seniors with everyday tasks. Community Care offers practical, nonmedical supportive services, such as driving to the doctor or preparing meals. Caring Companion Connections offers daily help with tasks like errands and personal care, plus daily Web status reports for family members. Actually, Betty knows exactly what the alternatives are. She has visited friends in assisted living and nursing homes, and she says she finds such places depressing. "We like to be around young people," she says. "There's so many walkers over there, and I feel sorry for them because they're in these long corridors." So the O'Connors have a plan: If and when Jack can no longer climb the stairs, they'll convert their first-floor family room to a bedroom. But they'll still need help, so Betty has begun recruiting friends and neighbors to help create what's called a "village," an organized network of volunteers dedicated to doing what's needed for seniors to stay in their own homes. For an annual fee, these communities help seniors manage household tasks they can no longer handle and arrange transportation when they can no longer drive. There are already 50 of these nonprofit groups around the country, with 100 more in the works -- and it's a trend that's expected to gain steam as baby boomers hit their golden years. Village organizers say the key is training seniors to reach out and request help, something that doesn't come easily. "We spend our lives from childhood being told, 'Be independent, do this for yourselves,' " says Gail Kohn, executive director of Capitol Hill Village in Washington, D.C. "Then we get to a certain point when we say, 'We want you to ask.' That's alien to all of us, and it feels like dependence." In three years, Capitol Hill Village has signed up 350 members. The $500 to $800 annual fee pays for a small staff, which helps coordinate a long list of volunteers. The village office is a borrowed row-house basement, where Julie Maggioncalda manned the 24-hour telephone help line one recent morning. She connected one member with a carpet cleaner, one of an array of vendors the village vets for reasonable rates and reliability. On another call, she lined up a volunteer to water someone's garden. Organizers stress that no need is too small. A lot of villages are in better-off neighborhoods, but Capitol Hill and others use private grants or public money so they can offer a steeply discounted annual fee to those who need it. And frequent callers may well get their money's worth. Kohn says tech help is a big need: " 'Fix my computer,' [or,] 'Program my watch,' or, 'Why is it that I can't download that?' "
Transportation is also popular. The village coordinates rides to doctors' appointments, the grocery store and the airport. It has sent volunteers to ride along in the ambulance when members have had to go to the emergency room. There are also regular social outings, plus activities geared to keep members in shape. "We have a third of our volunteers who are 30 and younger," Kohn says, "and they very much like playing Wii with our members, which helps the members with balance." The village even sponsors a monthly balance class in the basement of the local library. The aim is to help prevent a dangerous spill in the shower or a tumble down the stairs. Exercise, tech help and car rides may sound like small stuff, but added together, such support can have a huge impact. Members say it can make the difference between feeling the need to move into assisted living and having the confidence to stick it out on one's own for a few more months -- or even years. On a leafy Washington side street, Patricia Witt, 75, slowly climbs out of a car in front of her white brick townhouse. She wears those boxy, black sunglasses that seniors like, and she's leaning on a walking cane. A village volunteer has just brought her home from yet another doctor's appointment and escorts her to the door. 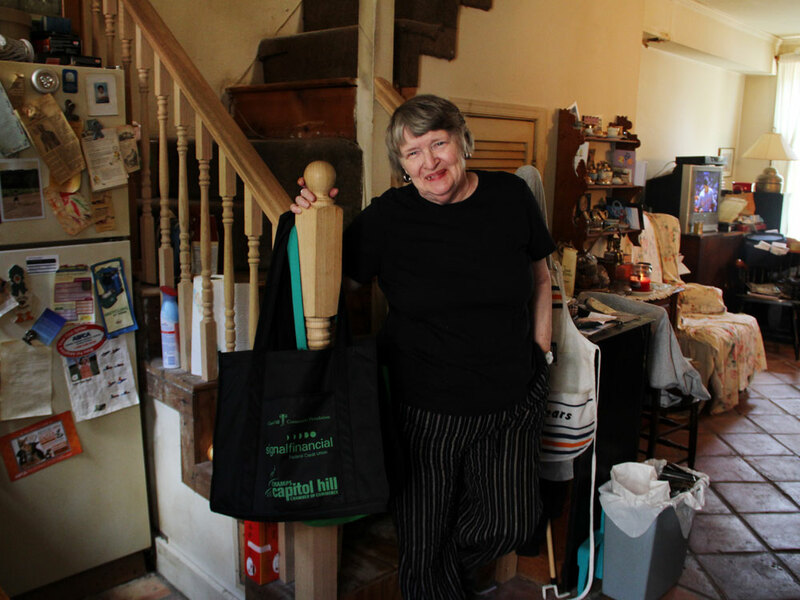 Patricia Witt credits the Capitol Hill Village for helping her stay in her home. Volunteers drive her to doctors' appointments and help with household repairs. "Well, thank you very much," she tells him as she fumbles for her keys. Witt has nearly lost sight in one eye and is recovering from surgery in the other. She has also had a heart valve replaced. She can't bear the thought of leaving her home but admits that she has begun to feel vulnerable. "I'm so afraid I'm going to fall," she says. "So then, of course, I've got stairs here." They're steep and narrow. But in her desire for independence, Witt even rationalizes that. "I could go up on my knees, actually. I can crawl upstairs," she says. But her open front stoop had become a menace. Capitol Hill Village found a handyman to put up a railing. The village rides save her cab money. Mostly, though, knowing that she has a support group to call on means her children -- who live in the Midwest -- don't have to worry so much. "I love my children, and they're very supportive of me," she says. "But you can't live together. It's very difficult." For as long as possible, Witt hopes the village can help maintain her privacy and independence in the home she loves.